Ngo Xuan Binh has devoted his life to bringing the Vietnamese martial art Nhat Nam to the world. Hoang Trung Hieu reports. The fierce screams of martial artists break the quiet afternoon at a club on the outskirts of Moscow as a class of young Russian men decked out in traditional Vietnamese clothes practise under the guidance of a middle-aged man. They are practising Nhat Nam, a martial art known for being 100 per cent Vietnamese. In the early 1980s, martial artists in Ha Noi were surprised to see the appearance of a new school, called Nhat Nam. Martial arts master Ngo Xuan Binh, 55, the school leader, explains that the name means the discipline is unique to Viet Nam. During the 1980s, the movement developed strongly in Ha Noi, Nghe An and other northern provinces. Binh's book Nhat Nam Can Ban (Basic Techniques of Nhat Nam) was awarded the "Most Valuable and Beautiful Sports Book" prize at an exhibition for publishing houses from socialist countries, held in Poland in June, 1989. "In the ancient lands of Ai and Hoan, now known as the provinces of Thanh Hoa and Nghe An, existed a martial art used by the local people to fight wild beasts and enemies," says Binh. "This martial art is based on nature. Ancient people studied the attributes of both flora and fauna, and their natural surroundings." Binh says in spring 1789, when Emperor Quang Trung led his army to the North to fight the invading Chinese Qing troops passing through Thanh Hoa and Nghe An, they employed many local martial artists. "Many of them fought bravely and sacrificed themselves for the Motherland. To commemorate the ancestors, our school chose the day of Emperor Quang Trung's Victory of Ngoc Hoi - Dong Da on the fifth day of the first month in the lunar calendar." But the school also faced bad times. When the Tay Son dynasty of Quang Trung fell, King Gia Long decided to kill people who collaborated with Tay Son and many martial arts schools were closed and their masters killed. The survivors had to operate secretly, but the Ngo Xuan family from Vinh City in Nghe An Province are some of the descendants of ancient martial artists. But through the passage of time, their heritage is gradually fading. Born into a traditional martial arts family, Binh has practised martial arts since he was a little boy. Having inherited basic techniques from his family, Binh also devoted his time to studying with martial arts masters in Thanh Hoa and Nghe An. When he was a student at the Ha Noi Fine Arts College, Binh taught his classmates fighting skills and created a martial arts movement to improve their health. After graduating from the college, he nurtured his passion for researching and practising martial arts. At the age of 24, Binh had already made extraordinary accomplisments in his martial arts career. He managed to unite different schools of Het (Screaming) martial arts in Thanh Hoa and Nghe An, and named it Nhat Nam. Nhat Nam School was officially established on October 23, 1983 in Ha Noi. At that time, Binh was an art teacher at the Ha Noi-based Central Music and Painting Teachers' Training College. Based on the small frame of Vietnamese people, Binh has developed fighting techniques for their movement, such as avoiding blows, striking swiftly and exposing vulnerable spots on the body of the enemy that can incapacitate them with high effectiveness. From 1983 to 1990, Nhat Nam developed quickly in Ha Noi and northern provinces, attracting many young people. Many of them have became famous for their exploits in the ring, and Binh's best students have continued his mission to spread the art throughout the country. Teacher Dao Hoang Long from Nghia Lo in the northern province of Yen Bai has been training his pupils for the last 23 years. In that time, he has co-ordinated with the provincial Education and Training Department to put Nhat Nam on the school syllabus, and has attracted 4,000 learners. With an eye on the future, Binh assigned his best students to manage the school in the early 1990s, and turned his attentions to developing this cultural heritage in Europe. The year 1992 marked a milestone in his martial arts career. Binh left Viet Nam for Belarus (under the former Soviet Union) at the invitation of the Federation of Wushu and other Vietnamese martial arts schools. He organised hundreds of workshops on Nhat Nam Martial Arts School and trained many martial arts instructors and students from more than 40 cities in the former Soviet Union. This was followed by the establishment of martial arts clubs in Russia, Belarus, Lithuania and Ukraine. "In Moscow and other cities in Russia, Nhat Nam has become a part of life for some local people," says student Sergei Yurevich. "The clubs attract a large number of people from different walks of life. They love to practise Nhat Nam drills as it not only helps them feel more brave and confident, but also improves their heath and outlook on life." After nearly 20 years abroad, Binh, president of the Nhat Nam Martial Arts Federation, registered to officially operate in those countries, is now promoting the establishment of the International Nhat Nam Martial Arts Federation. 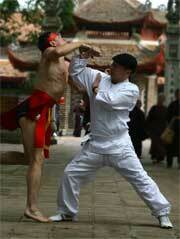 In these countries, people do not only know about Binh as a martial arts master, but also a culturist. He is a poet, a lecturer of Oriental philosophy at a university in Russia, an acupuncturist and a doctor of Oriental medicine who has treated thousands of Russian people, including high-ranking leaders. In October 2008, in Van Mieu-Quoc Tu Giam (Temple of Literature and the First National University of Viet Nam) in Ha Noi, Binh organised a specialised workshop on Nhat Nam Martial Arts School to celebrate its 25th anniversary. The workshop attracted more than 1,000 members from four large martial arts clubs. Professor Pham Duc Duong, head of Oriental Culture Research Institute, says: "I feel proud of Binh, who rose up as a cultural symbol, honoured by many people in Russia and Western countries. "I hope Binh, a special messenger of international friendship, will continue to bring into play the values of Nhat Nam across the country and among the international community." Today, Nhat Nam has more than 32,000 followers worldwide. Binh plans to establish the Nhat Nam Martial Arts Federation in Viet Nam in the near future. But this man still has another more important worry. "What concerns me is that many young people are physically lazy. Another concern is that many do not care about national history and traditional virtues. So when the Motherland faces danger, what will happen?